212 grants awarded since May 2000! Mary's Genealogy Treasures, a website started by Mary Tollestrup, houses over 20,000 genealogy links, including over 550 pioneer histories, a surname registry, and over 1100 webpages. Mary created the website to help Alberta, Canada Family History Center staff assist patrons in locating genealogy resources on the Internet. The website now helps people from all over the world find their ancestors. Mary will use the grant to purchase resources she needs to help update and maintain her growing website. The Conway County Genealogical Society in Morrilton, Arkansas provides a number of services to members, including publishing a monthly newsletter with genealogical tips and information, sponsoring the annual Arkansas River Valley Ancestor Fair that is a meeting place for anyone interested in genealogy, and sponsoring several genealogy workshops. The organization also runs the Conway County Research Library that provides a place for the public to begin their genealogy research. The grant will fund Internet service in the research library, allowing members and visitors to expand their research by going online. The Howard County Missouri Genealogical Society is a small society that has been accumulating resources and doing research in genealogy since 1993. They plan to use the grant to purchase bookcases and books to further their research activities. The Genealogical Society of Siskiyou County provides the only connection to genealogy for members in Yreka, CA, a rural farming community. The organization maintains a research center for meetings and to house their growing collection of local family histories and research aids from all over the U.S. They would like to add Internet access to their research center, providing members with the opportunity to contact experienced genealogists for assistance in their research. The grant will fund Internet access and wireless capabilities for the organization's research center. Kristina Mullenix is beginning a project to interview those who participated in the Civil Rights Movement in Meridian, MS, of which almost no documentation currently exists. Special attention will also be given to documenting women's roles in the movement. The grant will be used to purchase a digital camera for photographing interviewees and a tape recorder for proper transcription and documentation. 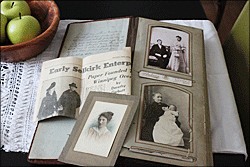 The Genealogical Society of Southwestern Pennsylvania provides research assistance, purchases research materials for the local library, offers how-to sessions, and publishes periodicals four times a year. The grant will fund updating their current website to a database-driven site to accommodate large searchable documents. Amy Smith is a doctoral student in the School of Communication Studies at Bowling Green State University in Ohio, focusing her dissertation on women as they conduct their own research into family genealogy. The goal of this project is to gain a better understanding behind the motivation of these women when conducting such research, as well as to gain insight into the impact genealogical data has upon family communication. The grant will be used for research expenses, such as audio tapes, transcription machine rental and travel expenses to and from interview sites. While working in genealogy since 1994 in the Georgian State Archives, Georgian Genealogy created one of the first genealogical websites in the country of Georgia. The website provides genealogical and historic information based on the state archives and libraries. The grant will go towards the purchase of a digital camera to be used to archive records and books, taking photos of historic places, etc. Ann Williams of Alberta, Canada has compiled a large body of data relating to the Astridge surname and has worked over the years with fellow researchers to connect long lost family members. A gathering of Astridges in Overton, Hampshire, England is planned for October 20-21, 2007 to celebrate the 250th anniversary of the marriage of the earliest couple traced, Aaron Astridge & Mary Smith. Approximately 74 of their descendants from the U.S., Canada, Australia, New Zealand and all parts of England are expected to attend. The grant will subsidize copies of materials to include wall-mounted charts and individual kits containing the weekend schedule, family trees, a listing of local places and their Astridge associations and the story of Aaron and Mary. The Wachusett Writers and Poets Club in Westminster, MA is a group of seniors, all over age 55, who met through a course in Creative Writing at the local junior college. They write short stories, poems, essays and more and self publish a text of their individual works once a year. Their love of writing continues to grow, as they explain: "We all have been bitten by the bug of writing since childhood. Retirement has allowed this love to blossom into the joy of telling for posterity." The grant will be used to fund a workshop for the group, guided by the Central MA Genealogical Society to enrich their research skills for the telling of family stories. The Cemetery Surveys, Inc. website, run by Rose Birdwell, posts pictures of every stone in each surveyed cemetery (over 1,000 currently online), plus panoramas. They also post birth and death certificates, marriage licenses, obits and other material with genealogical value. In the past two years, website traffic has increased to over a quarter million per month, slowing the server down and creating problems for their Internet service provider. They plan to use the grant to upgrade their server and to pay for a year of business internet. Clark County Internet Library provides research on local history, genealogy, and a host of transcriptions designed to assist family research of Clark County, WI ancestors. Information posted on the site is collected by 200 volunteers in 16 states and 3 foreign countries. They plan to use the grant toward the purchase of suitable shelving for newspaper microfiche used by all of the libraries in Clark County. And by the way, check out the cool book shelf on their home page! Seymour, IN is a town with rich history -- founded by "builders and busters, entrepreneurs and scoundrels" and the site of the nation's first train robbery. To document this history, the Seymour Museum board is in the process of creating a living history tour through the Riverview Cemetery to celebrate its 125th year. In this project, historians and actors will research primary documents and family histories to accurately portray notable individuals throughout Seymour's history. The grant will be used to help fund this tour, which will be held in April 2007. Lynn Maffessoli of Jersey City, NJ is making a documentary about the discovery of information surrounding her great-grandmother's unsolved murder. After researching her family's history for five years, she was startled to learn that her great-grandmother was murdered in March of 1930. In her documentary, Lynn will recount her ancestor's actions on the day she was murdered. The grant will be used in support of this documentary &mdash; and I confess that one of the reasons I selected this application is because it resonated with me since one of my own great-grandmothers was murdered in 1932. 100th Honoring Our Ancestors Grant Awarded! The Alabama Cemetery Preservation Alliance has been locating, registering and preserving Alabama's lost cemeteries since 2003. They have located many cemeteries that were hidden in the woods or about to be destroyed by new developments, and had legislation passed to protect the rights to visit those cemeteries. Their website is utilized by every county in Alabama as well as accessed by other visitors. The grant award will assist them with finding a new server for their website. The Italian Genealogical Group in New York is an organization dedicated to furthering Italian family history and genealogy, but one which benefits just about anyone who's ever had an ancestor reside in the metropolitan New York area. To date, they have computerized over 12,000,000 vital and naturalization records as part of an ongoing project. They will use their grant award for postage, envelopes and ink to keep the project moving forward. The Northwest Indiana Genealogical Society is a very active society that has over 50 publications, has walked and read all cemeteries in both Lake and Porter County, and has added numerous indexes to their website to assist researchers. They have recently come into possession of books that document marriages performed by the Justices of the Peace in Crown Point, IN. Because of the delicate shape they are in, it would do damage to them to scan these records or even copy by hand. The grant award will fund the purchase of a digital camera that will be used to copy the records. Through her website, Arkansas Ties, Pris Weathers has been photographing and archiving Arkansas history since 2000. She has over 200 cemeteries indexed online and over 1,800 pages of Arkansas History. The grant will cover website fees, allowing her to double the size of her site and provide even more Arkansas information and pictures. This grant was made in the form of a donation to pay for Social Security application requests stemming from the Unclaimed Persons group (now over 300 volunteers) on Facebook, created to help coroners locate relatives of identified persons for which no next of kin has been found. The group was a spontaneous outgrowth of the Unclaimed Persons series recently launched on RootsTelevision.com. Brian Bouchard of Brunswick, ME created a website for Maine genealogists, providing photos of more than 400 cemetery gravestones from Maine cemeteries and allowing visitors to upload their own photos. The website also has scanned images of antique letters and books, as well as a blog that keeps visitors up to date on things happening around the state related to Maine history and genealogy. With this grant award, Brian will be acquiring new letters for his Online Letters Collection, which is a set of scanned images of letters that are available for free to download/view with the goal of returning the originals to the related families. The Chester Historical Society began digitizing their archives in 1999. In 2003, they began a website for the Society, and then in 2006 joined the Hudson River Valley Heritage project making original source documents (obits, maps, indentures, estate accounts, etc.) available to the public. The grant award will go toward the purchase of a professional scanner and printer that can accommodate oversized original documents for the digital archive they are sharing online. Pam Smith of Evanston, IL was so motivated by Alex Haley's "Roots," she started what would become thirty years of research into her family history. Pam discovered that she shared heritage with the Tikar tribe of Cameroon, Africa and will be taking a group with her for her second trip to the country in July 2009. Traveling with the group will be a Cameroonian video crew who will archive the experience. The grant award will support the creation of DVDs for each traveler with highlights from the trip. The Germans from Russia Heritage Society in North Dakota is currently purchasing archival records from the former Soviet Union in an effort to gather information pertaining to the Germans that settled in the Black Sea region during the 1800s before migrating to North America. The grant award will go toward the purchase of a digital camera and computer system to handle records obtained from the Simperopol Archive. Yvonne Henriksson of SWEDENROOTS in Vegby, Sweden helps people in the U.S. find their Swedish ancestors. The grant award will be used to further her work in connecting people with information about the Swedish ancestors. The First International Black Genealogy Summit is a momentous event that involves all of the black historical and genealogical societies in the U.S., Canada and the Caribbean coming together to celebrate the joys and challenges of black genealogy. The grant award will be used to sponsor the 2009 Summit, taking place at the Allen County Public Library in Ft. Wayne October 29-31, 2009. Alice Yeager of Alabama Neighbors produced two documentaries last year, and is now recording cemetery tours led by local historians in towns all overAlabama. The main focus will be on tombstone artwork and motifs and the amazing stories of the people who are buried within the cemeteries (both the famous and the infamous). The grant will be applied to filming, editing, and production expenses. Tammy White was doing genealogy research with members of her family when they discovered that the Thomas/Simpson Cemetery (south of Pleasant Hill, Jackson County, MO) was so buried under weeds, thorn bushes, and trees, that you could not even tell it was a cemetery. The grant will provide funds for the continued up-keep of the cemetery, specifically stabilization of a fence that will protect the cemetery from nearby cattle. Alannah Ryane has been documenting a series of webisodes, called By Her Roots "The Search for Peter Martin." The videos are shot in Nova Scotia as Alannah explores her family history, and are available on RootsTelevision.com. The grant award will be used to upgrade Alannah's video editing software as she completes last webisodes of By Her Roots. Save Our Cemeteries is a non-profit organization dedicated to the preservation and restoration of Louisiana's historic cemeteries, and to fostering a public appreciation for their historical and cultural significance. They are currently working with Xavier University students to compile a record of those buried in St. Louis Cemetery No. 2 in New Orleans. The cemetery is the largest New Orleans' creole cemetery, spanning three square blocks. The grant award will be used in support of this project. The Phillips County Museum is one of the major genealogical and local history resources in northern Montana, providing access to historic newspapers, obituary files, homestead plat maps, county histories, family history files, and rural school records, as well as a small library of local history reference works. The Museum also maintains an extensive collection of historic photographs of the area that have recently been digitized. The grant award will fund the purchase of a computer to allow visiting researchers to access the digitized historic photographs and other digital resources. The Reno County Genealogical Society in Hutchinson, KS provides a local resource for research, programs, and educational workshops. This year, they established a community connection project and are currently working to purchase name signs for 16 local cemeteries. The grant award will support this effort. Many thanks to Megan Smolenyak Smolenyak for awarding us a grant in July for our Community Connections cemetery sign project. Here is a link to pictures of the first two signs being made. This grant will help us purchase 4 more signs. The Indiana Genealogical Society in Fort Wayne, IN is working to preserve and digitize 25-40 boxes of probate records that have been stored in the basement of the Hendricks County courthouse. These records date from 1824 (when the county was founded) to 1899 and have never been microfilmed, indexed or otherwise accessible to the public. The grant award will fund the purchase of a camera needed for this project. Additional contributions welcome! Kelly Bickle and his wife are third generation owners of The Burns Studio in Boise, ID. The studio was built in 1919, and there are more than 100,000 negatives of people in Idaho. They are currently working to catalog and put the pictures online so people can search for their family portraits. The grant award will help fund the purchase of EmbARK Cataloguer for use with this project. *Update from Kelly Bickle: I ended up not using the grant to buy EmbARK because the software was too expensive. I did use it to help create a database and a web site, Boise by Burns. Thank you again for the grant. The goal of the Boulder Pioneers Project in Colorado is to identify the original pioneers to the area for Boulder's upcoming sesquicentennial anniversary. The list currently includes more than 10,200 people. The grant award will go toward providing gift copies of the indices to the major genealogical research libraries. The Friends of the Archives Historical &amp; Preservation Society of Monroe County, Tennessee brings historical records into public usage through their archives and on the Internet. The grant award will fund the purchase of archival grade, acid-free boxes so the organization can safely store donated journals and very old family bibles. Anthony Vermandois has been researching families from several towns in Campania, Italy, and set up a website to share what he's learning. His goal is to gather basic data on individuals from each family to create a mini-biography for these individuals. The grant award will fund website and equipment costs for the project. Judy Rosella Edwards' weekly newsletter, Greenspace Genealogy, focuses on the genealogical history of private property that is donated to become greenspace. The newsletter is sent to land conservation and preservation agencies hoping to inspire donors, as well as genealogists who are researching families who lived in the greenspace. The grant will help cover the newsletter expenses. The Tri-State Genealogical &amp; Historical Society is a non-profit organization dedicated to preserving the history of the tri-state area of Ohio, Pennsylvania and West Virginia. The grant award will help fund book shelves to house their massive collection of books and family history resources, and enable the society to purchase additional books to continue to build their archive. Afro-American Historical and Genealogical Society in Nashville, TN provides research and technical workshops for writers, as well as lectures and tours for the public. The grant award will go toward research, planning and implementation of a series of lectures and tours, focusing on positive events experienced on plantations in Tennessee. The Ebenezer Avery House and Museum in Groton, CT contains many artifacts from the 18th and 19th centuries that relay family history as well as the social fabric of times past. The House displays nine samplers stitched by Avery Family members between 1788 and the mid-1800s. The grant award will help fund replacement picture frames, display cases, and packaging with archival and preservation-friendly materials so they can survive for future generations. In honor of celebrating 10 years since the start of the grant program, we are thrilled to award our May grant to the Sorenson Molecular Genealogy Foundation (SMGF), which is also celebrating 10 years of existence! SMGF provides collection and analysis of genetic and genealogical data to assist people in extending and verifying their ancestry. One of SMGF's recent initiatives is an ongoing project that involves an in-depth analysis of the Native American mtDNA phylogeny. There were two science papers published (Achilli et al. 2008, PLoS One and Perego et al. 2009, Current Biology), which have been highly used by the genetic genealogical community by those interested in verifying and studying their maternal Native American ancestry. Ugo Perego from SMGF is currently completing a third paper on this topic. The grant will be used to cover the lab cost to produce additional complete mtDNA sequences necessary for this type of research. Dina Scheel of Los Altos, CA is researching the victims of the infamous Triangle Fire in 1911. A lot is known about the fire, the legal aftermath, and its effect on labor laws and unions, but very little is known about the victims. Dina is trying to build a picture of each of the approximate 150 victims. The grant award will go towards ordering vital records for the research project. Eileen Curley has been conducting genealogical research for over 10 years. She recently began scanning and preserving boxes of notes compiled by her great-grandfather, James E. Conlon, in the early 1900s. He was a clock maker and antiques dealer in Boston and collected a great deal of historical research on various clockmakers in the 1700s and 1800s, including photographs, handwritten notes and drawings. The grant award will help fund archival quality materials to preserve the originals. Eileen's hope is to be able to donate the original research documents to a local library or the New England Historic Genealogical Society where others may benefit from her great-grandfather's research. Antiques Roadshow should thank her! The Macon County Historical Society maintains the genealogical library and website for Macon County, NC. The Society is currently working to digitize the Lawrence Wood Collection, an expansive collection of local genealogical research conducted by Mr. Wood, a native of Macon County and an avid and well-respected genealogist. The grant award will fund the purchase of a multi-feed scanner so the Society can digitize the family group sheets, documents, newspaper articles and oral histories collected by Mr. Woods for use by other local researchers. Johnson County Historical Society recently opened a Heritage Center that provides museum displays and a research center with the goal of becoming a one-stop-shop for family history research in Johnson County, Arkansas. A database is being compiled of all known deaths in the county from printed sources, funeral home records and family researcher records. The grant award will fund a removable hard drive to allow the Heritage Center to back up the county burial database, which is about 80 MB at present and growing exponentially. I had the pleasure of conducting research at the Bassett Historical Center in Bassett, Virginia while delving into Michelle Obama's ancestry. This vicinity of Virginia is home to more of Mrs. Obama's heritage than any other location, so was of particular interest. Fortunately for me (and countless others), the Center is the kind of resource-rich, high-activity, enthusiastically-staffed organization that we all dream of when we venture on genealogical field trips. For that reason, it is the recipient of this month's grant to apply however it's most needed or useful. A new Archives Committee in Houston County, TN is starting the process of establishing a much-needed local archives. Members of the historical society have started to clean out and organize the records vault in the basement of the local courthouse. The grant award will go toward the purchase of archival boxes and supplies to store record books and loose records. Kelley Logan is a folklorist with Southwestern Oklahoma State University, and is currently researching the Tuberculosis Sanitarium Cemetery in Clinton, OK. The cemetery is in bad repair and a full list of those buried there does not exist. The grant award will be used to recover the gravestones now subsided a few inches under windblown soil and make a full record of the buried and map the cemetery. The Benton County Genealogical Society in Philomath, OR provides genealogical resources to the community including printing cemetery and marriage books, posting WPA records, and an online Benton County Pioneer Database. The grant award will fund the digitization of two old newspaper microfilms for the surname index to Benton County newspapers. The Southwest Michigan Black Heritage Society in Kalamazoo, MI has been documenting the history and contributions of African Americans in southwest Michigan since 2003 through oral histories with descendants of original African American families in the area. The organization also works with families in the community to help them in writing their family histories through workshops, the Society's website, columns in a community newspaper, and private consulting. The grant award will be used to help fund an intergenerational family history weekend that will include training families on how to do their own oral histories and guiding them in developing a family book. The Battle of Plattsburgh Association in Plattsburgh, NY develops and operates the Battle of Plattsburgh Interpretive Center and War of 1812 Museum. Through the Center, they collect, preserve and maintain artifacts while also providing genealogy searches related to War of 1812 and Battle of Plattsburgh military service, free of charge. The grant award will assist in funding a series of genealogical workshops entitled, "Finding Your War of 1812 Ancestors," that will show participants the different types of records available to them, and where and how they can be accessed. Through her blog, "Thoughts from Polly's Granddaughter," Twila Curtis Barnes shares information about Cherokee history, genealogy and other things that are of interested to the Cherokee community. She also offers free genealogy services for any registered Cherokee that wants to learn about his/her ancestors. The grant award will help Twila conduct a video research project in which she will interview local Cherokee elders about their childhood, family traditions and histories, and other stories passed down in their families. George Eder, Jr. has been working to clean up an old cemetery in what was the coal mining community in Sun, WV. This cemetery was established in 1920, and has many sunken and unmarked graves, as well as broken headstones and headstones which are now unreadable due to weather and vandalism. The grant award will help fund the purchase of weed killer, gravel and engraved plaques for the headstones that are now unreadable. Amy Brown-Arneil has been creating an obituary index from the mircofilms of the Marlette Leader Newspaper while she researches and writes a book on the pioneers that settled before 1900 in Marlette, Elmer, Flynn, Lamotte, Moore and Evergreen Townships of Sanilac County, Michigan. She has currently compiled information on over 300 pioneers for the book. The grant award will help cover book publishing and printing expenses, as well as assist with the cost to print copies of the obituary index for the Marlette Leader Newspaper. The Skagit Valley Genealogical Society (SVGS) provides educational programming throughout Skagit County, Washington on research methods, getting started in genealogy, and more. The SVGS genealogy library currently has a collection of over 1,500 books, and has outgrown its shelf space at the Burlington Public Library. The grant award will help fund the purchase of more shelf space for the growing collection of books, and will be used as a matching gift "seed" to encourage others to join in and help SVGS by matching this initial gift. Mary Moran and her husband received a number of boxes of Moran family letters, documents, pictures, tintypes, cabinet cards, invitations, birth announcements, playbills and more from the family home in Dresden, TN, dating back from the mid-1880s to the mid-1960s. Mary is working to scan in all of the information to preserve it and share it on her blog. The grant award will be used to purchase a scanner that can scan high-resolution images, negatives and large documents. The Smyth County Genealogical Society in Smyth County, VA is working to digitize old family documents from the local area, including Bibles brought in during a recent "Family Bible Photography/Preservation Project." After these documents have been photographed, the digital copies are made available online and a hard-copy is maintained in the Southwest Virginia Heritage Room at the Smyth-Bland Regional Library. The grant award will go toward the purchase of external hard drives and scanners so the Society can continue this digital archiving project. Cemeteries are an important part of genealogical research, and Helen Sharpe understands that as well as anyone involved in genealogy. She has spent the last year locating, photographing and researching cemeteries in Nash County, NC. In fact, she has personally researched 234 cemeteries. The information she has gathered is being used to trace ancestors of both the American Revolution and the Civil War. She is working on developing two books, one on her cemetery research and one on Civil War veteran gravesites, for use in the Braswell Memorial Library. The grant award will help fund the printing and binding of the books, and other costs associated with compiling and preserving Helen's research. Established in 1983, the Fayette and Raleigh County Genealogical Society is a small, yet very active organization. Some of their current projects include reading and recording all of the cemeteries in Fayette and Raleigh counties, publishing a quarterly newsletter, converting records from microfilm to DVD, updating previously published census records to include slave records, and developing a Research Guide which will be made available at the Courthouse and Visitors' Centers. They have also published seven Fayette County cemetery books to-date. But like so many genealogical societies and libraries, they are struggling to cope with the impact of a down economy. They recently lost storage space in the local county library due to space constraints, and have been required to move all materials to a storage unit until a new space is made available. The grant award will help alleviate the financial burden of paying for temporary storage so they Society can continue their good work. I'm fortunate enough to live within a few blocks of The Historical Society of Haddonfield, the kind of organization I wish every locality had. Haddonfield is one of those cozy towns that's been here since colonial days and features many houses with small plaques noting the original owners. While none of my heritage is based here, I have lived in Haddonfield as long as I've lived anyplace else and benefited in multiple ways, including the society's generous permission for BBC to film here. This particular grant is in support of the conservation and preservation of Greenfield Hall, a building which the society aptly refers to as its "beautiful Grande Dame." The hall is used for a variety of purposes from hosting events to housing a library that makes me jealous of those with Haddonfield roots! A researcher of the gold strikes in Alaska, Susan Gibson is writing short biographies of the thousands of early pioneers who lived, worked and mined in the Fortymile country of Alaska. The biographies will be gathered into a book, with copies to be donated to the University of Alaska Elmer E. Rasmuson Library and the Fairbanks North Star Borough Noel Wien Library. The grant award will be used for travel expenses to and from the Dawson City Museum Archives, where many records of these pioneers are located. The Vine Lake Preservation Trust in Medfield, MA serves the genealogical communities who visit Vine Lake Cemetery by providing walking tours to interpret and celebrate noteworthy events and persons buried on-site, as well as support for family historians and collaboration with professional genealogists. The grant award will assist the Trust in developing a self-guided walking tour map, titled "Walk Among the Shadows." The map will be the first in an information series that will provide stories of 50 selected persons buried in the cemetery. The Family History Information Standards Organisation is a new organization that was created to help develop a new standard to facilitate the transfer of genealogy information from program to program. The grant award will be used toward incorporation and other startup fees of the organization. The Black Earth Public Library serves a community of approximately 1,300 people and is located about 20 miles west of Madison, WI. In 2011, a war memorial was installed across the street from the library. It has the names of local residents who have served in all the major wars, starting with the Civil War. The names were submitted by living family members and veterans themselves and compiled by a local veterans organization, but there is no biographical information available for visitors to the memorial. The grant award will be used to request military records and compile this biographical information into a book for genealogical researchers and visitors to the memorial. For the 12th anniversary grant, I decided to do something I've never done before. I sought out an unsung hero - someone who probably doesn't get enough recognition for what they contribute to the genealogical world - and I selected Tom Tryniski of FultonHistory.com. If you're not familiar with this website, I'll briefly explain that Tom single-handedly scans and uploads millions of pages of newspapers, much like some larger, commercial organizations. The site initially focused on Central New York, but has branched out to include newspapers in nearby areas ranging from the Pennsylvania border to Brooklyn. I have no idea how he does it, but he does and I'm grateful, so I took advantage of the PayPal donation option he provides on the website. If you have ancestors in that area, do yourself a favor and check it out. And by the way, it's one of the more amusing websites you'll encounter! For the 150th grant, I opted to do something a little different. I was fortunate enough to start playing with genealogy way back in the 6th grade due to a homework assignment. Mrs. Berkowitz provided the spark for me to become a professional genealogist today. For that reason, I thought I would see whether I might be able to pass that spark along. I've long been a fan of DonorsChoose.com, an organization that allows you to browse and support school projects. Many know that education in our country is suffering and both students and teachers are affected. This is a great way to help make up for at least a little of the relentless deficits in our school budgets. So I did a little searching and picked five projects across the country that had some aspect of family, national or international history and culture associated with them. Just maybe a couple of the students will feel the pull of genealogy and contribute to our field and understanding of our history in the future. The Genealogical Society of Douglas County in Oregon provides a library of genealogical resources such as books, magazines, cemetery records, obituaries, personal genealogical records and family histories. Their goal is to preserve these resources while making all of the records available to the general public. The grant award will allow them to purchase materials so they can build bookcases for storing and displaying their genealogical resources. Pete Pin, of Cambodian "Killing Fields" heritage, is conducting a project to "photograph in Cambodian communities across the U.S. Northeast, generating intergenerational dialogue around unspoken memories." It's the photos he's already taken that convinced me to support this worthy initiative. A donation was made to Cyndi's List because Cyndi Ingle Howells has been tirelessly providing an invaluable service (almost entirely at her own expense, not to speak of the countless hours she's dedicated) to the genealogical community since March 1996, so this is a token of appreciation. If you use her website (and you probably do! ), please consider making a donation as well. Jackson County Genealogical Society in North Carolina has published a number of books in addition to their quarterly journal which has been provided to all members since 1991. The grant award will be used to reprint Volume II of their Macon County cemeteries book. This month's grant was given to JewishGen, a valuable resource I've used many times over the years. If you have any Jewish heritage or have ever used the popular SteveMorse.org website, you're already familiar with all JewishGen has to offer, including countless databases and many other tools and resources. If not, I encourage you to visit and explore. Like so many genealogists, I hold a special place in my heart for Ellis Island, so when it was badly damaged by Hurricane Sandy, it seemed a fitting time to make a donation to the Statue of Liberty-Ellis Island Foundation (SOLEIF). If you had one or more ancestors who came to America via Ellis Island, please consider making a donation in their name to help this national landmark re-open as soon as possible. I wonder how many know that Wikipedia is a non-profit organization that operates off of donations. I didn't, and yet I use it all the time. And yes, as genealogists, we know that it's a good idea to double check information found here, but what a terrific resource for getting a running start on just about any topic. I know I hit it up for everything from 19th century politicians to obscure Ukrainian villages, so this month's grant goes to the Wikipedia Foundation in gratitude for a resource that's often taken for granted. Maureen Taylor, The Photo Detective, has spent ten years journeying through databases, private collections, and museum holdings to find as many photos from the Revolutionary War Generation as possible. So far, she has located over 200 of these images, and some of them are profiled in The Last Muster: Images of the Revolution (Kent State University Press, 2009) and The Last Muster: Faces of the Revolution (in press, 2013). Maureen is now partnering with award-winning Verissima Productions of Cambridge, MA to bring the photos, and the stories behind them, to film. In order to produce and distribute "Revolutionary Voices" they are raising a total of $225,000. This month's grant award was made in the form of a pledge for this project on Kickstarter. Please consider making a pledge to help get this wonderful project off the ground! Girl Museum is a completely virtual museum that focuses on research and exhibitions about girl culture from across time and space. They recently started the Heirloom Project, which is an opportunity for girls to investigate their own families to find out more about their genealogy and histories through interviews and researching old photographs, artifacts and heirlooms. Girls will submit their discoveries to Girl Museum and become part of a large exhibition that will go online at the end of 2013. The grant award will be used toward the creation of a downloadable PDF guide, several how-to videos and online support for participants. The Du Quoin Historic Preservation Committee was established in Du Quoin, IL in 2005 to encourage local homeowners and business owners to improve upon and/or renovate their properties in the name of historical significance. The organization showcases homes and shops, and through this exposure, they are preserving the genealogy of the town through its people, business owners, and those who have helped to place their imprint on the community. The grant award will be used to toward a project to have the 1953 Centennial edition of the Du Quoin Evening Call reprinted to celebrate the town's 100th anniverary this year. The 60-page newspaper includes biographies, human interest stories, and pictures of the community. The Daviess County Public Library in Owensboro, KY has the largest collection of genealogy and local history materials in a public library in Western Kentucky. They have partnered with the Owensboro Museum of Science and History for a local history project called "Voices of Elmwood." As part of the project, they will research people who have been buried in Elmwood Cemetery, create a script, and have actors reenact their lives during an October hayride through the cemetery. The grant award will support this and other initiatives at the library. Recently, I announced what I'm calling my LUCKY 13 initiative and committed to giving 13 grants for the purpose of purchasing family treasures from pawn stores, doing the detective work to track down descendants of the original owners, and returning the item to that family. I'm pleased to announce that the first of this Lucky 13 grant series (number 163 overall!) has been awarded. Carol MacKay of Family Photo Reunion of British Columbia reunites old photos that she finds in antique shops and second hand stores with families of origin, and will use this grant to cover the purchase of a carte de visite photo album and a few other items she rescued in Calgary. Update: Carol reports a successful reunion of this album with descendants of the original owners! The good folks at the Federation of Genealogical Societies (FGS) and the National Archives have teamed up for Preserve the Pensions, an initiative designed to fund the digitization of War of 1812 pension files. If you've ever been fortunate enough to come across pension files of any sort for your ancestors, you know how incredibly valuable they can be. If circumstances permit, I hope you'll consider possibly supporting this undertaking yourself. Barbara Conner of Michigan really took the Lucky 13 challenge to heart! Though she had never stepped foot in a pawn star before, she took the opportunity to do so during a Michigan to Mississippi road trip, and purchased a cigar box filled with letters a Tennessee serviceman had written to his new wife back home during WWII. Not one to let moss grow under her feet, she's already located the family and will return this family treasure shortly. Next up? A bed-warmer dated 1895 with part of a name inscribed on it. This month's grant, representing the second in the Lucky 13 series, was made in support of this and other orphan heirloom rescues planned by Barbara. This month's grant recipient is Kim Ostermyer of The Wyoming Room (an extension of the Sheridan (Wyoming) Fulmer Public Library). The room is a substantial research facility and unique in the region, serving historians, genealogists and the local municipality. The funds have been designated to acquire a portable scanner and scanner mouse which will be used to digitize and catalogue Sheridan, Wyoming City directories. Using OCR software, the images will then be placed in a searchable engine to assist researchers in locating specific information about residents and businesses. Mary Lovell of the Seymour Public Library (Auburn, New York), which offers genealogical and local history workshops and resources, will use this grant to purchase a Flip-pal mobile-scanning unit for public use. Programs will be given on using the Flip-pal to save family photos and documents, and on using Photoshop Elements for restoration. Jason Gavin, who recently joined the Williamson County Public Library (Franklin, TN), is receiving a grant to address preservation concerns — specifically, measures to cope with humidity in the library's manuscript room and to protect a rare 1878 map of Franklin, Tennessee that shows family names and landholdings at that time. A grant has been given to Cathy Horn of Rochelle, NY to purchase archival quality supplies for her research on a tragic event at Grand Central Station (NYC) in 1902 which resulted in the deaths of 17 people and the destruction of the old Grand Central Depot, triggering the building of the present-day Grand Central Station. Once completed, Cathy will turn all documents and reports over to the Westchester County Historical Society in order to make them accessible to others.